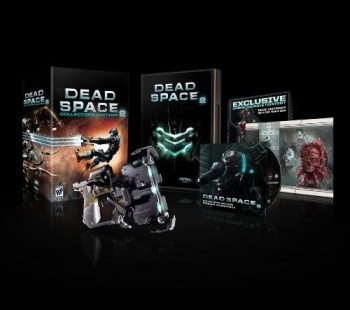 An online listing has revealed a Dead Space 2 bundle that is tooled up and loaded for bear. The necromorphs of the Dead Space games are tricky beasts, because you need a very particular tool to prune their limbs and take them out. An axe or sword would do it, but you need to get awfully close to the monster to use them. Thankfully, the collector's edition of Dead Space 2 gives you access to a plasma cutter both inside and outside the game so you can battle off necromorphs if they try to jump you in the kitchen. The listing for the collector's edition briefly appeared on Amazon, along with a picture, but was swiftly removed from the site. As well as the replica plasma cutter and the copy of the game, the collector's edition contains a CD soundtrack, a piece of Dead Space art and some exclusive downloadable content. Unfortunately, there's no word on how much the bundle will cost, but going off what publishers have charged for other collector's editions, assuming a price tag of around $100 seems like a safe bet. Admittedly the picture of the plasma cutter is rather small, but from what I can tell it looks like a pretty detailed replica. Of course, this could turn out to be another Arkham Asylum situation, where the included batarang was cheap and disappointing, but hopefully the plasma cutter will just as cool as you might hope. Dead Space 2 is scheduled for release for PC, PS3 and Xbox 360 on January 25th.